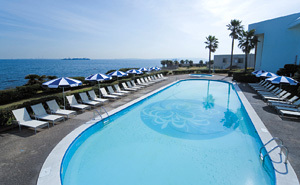 Facilities | Kannonzaki Keikyu Hotel official website. The hotel is only about one hour from Haneda Airport. Treatments in the room with a superb view of the ocean and horizon♪ Sea Moon’s signature herb mist is combined with hydrogen water and 10 herbs (quasi-drugs) to warm you up from your body core and drain the body wastes with sweat from the sebaceous glands. We help you revitalize your body and skin, and improve your digestive health . We assist you to resolve the specific problems of women! Free car parking is available. Please experience our treatment for a couple. We also welcome non-residents. *Open only during the summer season. There are many exciting places you can visit in Kannonzaki while you stay at our hotel. This is a museum surrounded by nature: Tokyo Bay in front and a deep forest in the back. Visitors can enjoy a leisurely time while strolling along the pedestrian path, visiting a lighthouse and the relics of a battery, and thinking about how nature, history, and art are related to one another. Monkey Island is the only natural island on Tokyo Bay. On the island, which takes about 10 minutes by boat from Mikasa Pier, visitors can enjoy playing on the beach, walking around the Island, and swimming in summer. There are a cruising tour between Sarushima and Mikasa that departs from Kannonzaki Pier (about three minutes on foot from the hotel) and the Yokosuka Naval Port Cruise that departs from Shioiri Pier. This is a flower park where both adults and children can enjoy not only seasonal flowers, but also many amusement attractions, such as an herb restaurant, a Godzilla slide, a flower train, a park golf course, and an archery and air rifle range. Please come and enjoy our beautiful seasonal flowers. There are a variety of events, including the Fantasy Show by adorable fish, dolphins and sea lions, where visitors can even get to touch and feel them! Come and feel comforted by these cute sea creatures. A new display section called “Otter’s Forest” is also popular among visitors. This is a Japanese-style hotel. Guest rooms offer a grand view of Koajiro and a luxurious private time, in which guests can get away from the hustle and bustle of the city and unwind. 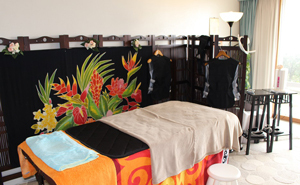 The hotel also has services for day-trip visitors.